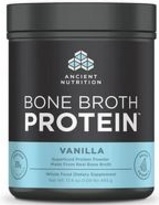 Bone Broth Protein Vanilla has the classic, lightly sweet vanilla flavor you know and love. It’s versatile flavor makes it great for both smoothies or baking. Use in smoothies or with almond milk and half a frozen banana in a blender for delicious post-workout beverage. Other Ingredients: Natural vanilla flavor‚ xanthan gum‚ guar gum‚ stevia extract‚ monk fruit extract.